Crownline CR290 - there are many key reasons why you should make this SUPER cruiser your next boat! It is a very roomy, smooth riding, versatile, comfortable, spacious, cuddy cabin / cruiser made by an industry leading boat manufacturer Crownline. It is loaded with numerous features and is a joy to ride in on even in rough waters. I have owned this cruiser for seven years and have had NO PROBLEMS! This 1999 Crownline Cruiser CR290 features two Volvo Penta 5.0L GI engines. It has two reliable Volvo SX I/O stern drives. It rides great on rough water, has a very roomy cabin and tons of features! This cruiser features UNIQUE SLEEPING and lounging accommodations! First of all, it has TWO BERTHS! The main sleeping berth is located mid-ships at the stern end of the cabin and features a full sized bed. There is also a forward birth for sitting or sleeping. The cockpit features LOTS of cushioned seating for passengers! The captain’s bench seats 2 people. The lounge seats 3 passengers. The stern bench seat (removable) seats 3 people. A removable jump seat holds 2 passengers. A rear facing bench holds 2 people. 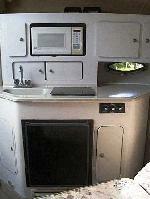 Full Kitchen with electric/battery frig, microwave, cook top, sink, etc. The entire hull is flawless and does not leak. The 2007 3 axle (two w/brakes) Loadmaster trailer is made from aluminum and is in like new condition! The trailer has new tires and bunks. 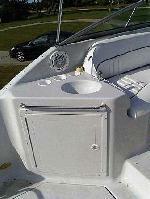 You can purchase the boat without the trailer for $ 23,900.00 (FIRM). The trailer can be rented to transport the boat. The boat and trailer can be bought for $ 27,000.00 (FIRM) - $ 7,230.00 BELOW NADA VALUE! I would consider a trade is you have a 23-24 Ft. DEEP V Bowrider boat and trailer. 5.7 engine or larger. Send me pictures and complete details if you have one in very good condition. If you are interested, I have lots of additional pictures. Kindly reply to this ad with your NAME and PHONE NUMBER and I will email them to you. 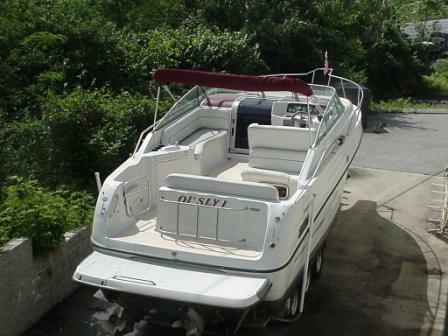 Or if you would like to see this boat, let me know that in your reply and I will call you to schedule a convenient time. This boat is located on Pickwick Lake at 12580 Highway 57, Counce, Tennessee 38326.